FORE! Click here to play!
! You'll have to take to the course to slug a few balls on the greens in this slots game. Spin the reels for a chance at hole in one and plenty of cash! Like all golfers, you'll want to aim for eagles on those long shots. The eagle symbols act as an expanding wild, which means they will expand across an entire reel to substitute for all other symbols (excluding scatters) to help you create more winning combinations. He will only appear on selected reels, so you'll have to keep a close eye out. The golden one is another symbol to watch out for. Spin three to five and you'll get up to 750 times your line bet. There are plenty of other symbols on this course to help you collect the top prize. Watch out for gold balls, the Hole in Won symbol, Fore, umbrellas, golf carts, golf bags, caddies and shoes. You'll also want to try for birdies. Spin three or more of these anywhere on the board will trigger a bonus round that will see playing nine holes for a chance to win even more cash. Take to the course and practice your swing to bring in plenty of green! The eagle symbol acts as an expanding wild. It only appears on reels 2, 3 and 4 and will expand across the entire reel. It will substitute for all other symbols to help you create more winning combinations. The birdie will trigger a bonus feature. Spin three or more anywhere on the board and you will trigger a mini golf round. You will have to place the ball and hit for a chance at a hole in one. If you're successful, you will be rewarded with cash prizes. 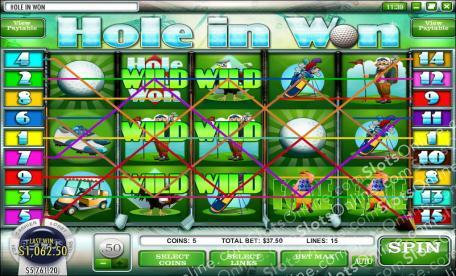 Each time you trigger the bonus round, you will face one of nine holes. You could win up to 37,500 coins! Rival Gaming software allows you to use an auto-spin option; however, it is only available for real money players. Once you click on the Auto button, you will be allowed to customize the auto-spin to your liking, including setting the number of spins you want it to stop after and how long you want the game to pause between each spin so that you can look at your winning lines.